Customer support startup Get Satisfaction has raised $6 million in Series A funding led by Azure Capital Partners with O’Reilly AlphaTech Ventures and First Round Capital participating in the round. The company previously raised $2.3 million in seed funding from investors including SoftTech VC, FreeStyle Capital, and Kapor Capital. Founded in 2007, Get Satisfaction develops and operates a network of customer support forums where customers can post their own questions, ideas, problems, or conversations about a product. Companies can also claim their board and put their own employees on to moderate the boards. Zappos, Foursquare, Twitter, Mint.com and Nike have all created customer support communities on the site. Currently there are over 40,000 communities that have been created on the Get Satisfaction platform. More recently, Get Satisfaction has been tapping into the customer conversations taking place on social media sites. In 2008, the startup ear to Twitter to help its clients monitor Twitter for mentions of brands. And earlier this year, Get Satisfaction launched a customer support tan for a brand’s Fan Page. Customers can begin wall discussions in the form of four topic types: Ask a Question, Share an Idea, Report a Problem, or Give Praise. When customers begin to post a question, Get Satisfaction searches for and suggests similar threads to give consumers instant answers to commonly asked questions. All questions, comments, and answers are discoverable via Google and other search engine. People can respond to any thread — i.e. voice a similar problem, suggest a remedy, emerge as an advocate in response to another’s complaint, or offer a new twist to a product suggestion. Community members can also make their experience heard by simply clicking ‘me too’. In turn, any question, idea or problem posted on a brand’s hub on Facebook will be automatically imported into the brand’s Get Satisfaction web interface, allowing marketers and customer support reps to access the conversation from their Get Satisfaction site. The Get Satisfaction platform also connects with existing enterprise tools (such as Salesforce.com and Zendesk) to make CRM offerings, help desks, and other back-office solutions smarter. With the new funding, Get Satisfaction will invest in its team, product development, marketing, as well as focus on building partnerships with digital agencies, CRM providers, and distribution partners. Over the past year, the company has also gone through a leadership transition. In August, co-founder Lane Becker stepped down as President of the company. And Wendy Lea took over for co-founder Thor Muller in early 2009 as CEO (Muller stepped into the CTO role). Today, the company has added Jeff Nolan as VP of Product Marketing and Tony Pribyl as Director of Strategic Partnerships. 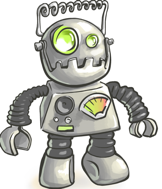 The company has also revealed a new mascot (pictured here)-his name is JarGon the customer service robot (and our nemesis). According to Muller: JarGon is the customer service robot. He has no heart and isn’t capable of love. He was created in a secret lab to frustrate customers, and Get Satisfaction is locked in an epic battle to protect the populace from this bumbling, metallic menace.